I was on my computer and ran across a news article that features Dr. Oz on my home page. He is a cardiothoracic surgeon and a television personality made famous by Oprah. In the article, he was asked to speak before the Senate for potentially deceptive advertising for weight loss supplements (Firger, 2014). I was curious about this so I watched the video that accompanies the article. I won’t comment on whether he did or did not use deceptive advertising but something caught my attention. In the video, Sen. Claire McCaskill tells Dr. Mehmet Oz, “with great power, comes great responsibility” (Firger, 2014). I asked myself, where does this power come from? Lots of people try to sell weight loss supplements and the Senate does not see them as a threat. What makes him so special? I think the principles of applied social psychology can help explain why. In my opinion, Dr. Oz exerts a large amount of social influence. Social influence being defined as the interactions with others that leads to changes in our attitudes, beliefs, values, or behavior (Schneider, Gruman, & Coutts, 2012, pg 171). So in other words, when Dr. Oz interacts with others, it can lead to changes in their attitudes, beliefs, values, and behavior. When he is trying to interact in this way through his television show, it is called persuasion (Schneider, Gruman, & Coutts, 2012, 171). So the question became, what makes him so persuasive. First, we need to understand the kind of message he is giving. I would define it as an informational message. An informational message provides facts and arguments for why people should be engaging in certain health behaviors (Schneider, Gruman, & Coutts, 2012, 171). Now, the Senate has called into question whether his advice is actually healthy (meaning they might not be facts) but that is not my question. His persuasive technique is built around an informational message and that is what matters. With this as my assumption, there are certain criteria that applied social psychology can use to predict how persuasive this informational message will be. Using these criteria as measurements of his persuasiveness, I intend to show why Dr. Oz is so powerful. So lets begin with the criteria that make an informational message persuade. In order for an informational message to be effective, it should come from a credible source. 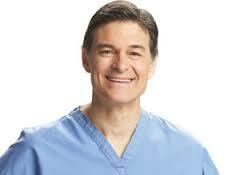 Dr. Oz is a heart surgeon, which gives him substantial credibility. Also, the person should be attractive and similar to the audience (Schneider, Gruman, & Coutts, 2012, pg 171) because attractive faces tend to be thought of as more sociable, extroverted, and popular (Aronson, Wilson, &Akert, pg 275). Furthermore, people tend to prefer faces similar to their own and it may come from a feeling of “familiar is safe” and “unfamiliar is potentially dangerous” (Aronson, Wilson, & Akert, pg 274). Dr. Oz can be thought of as “good looking” and is like the target audience. Even though attractiveness seemingly has nothing to do with anything, there seems to be an “attractive is good” stereotype (Aronson, Wilson, & Akert, pg 275). So these qualities combine to make him trustworthy and thus help him be persuasive. Another important aspect of an informational message is whether people take the message to heart (Schneider, Gruman, & Coutts, 2012, pg 171). Dr. Oz does a great job of this by grabbing attention with “fear appeals” (Schneider, Gruman, & Coutts, 2012, pg 171). Using headlines and phrases like, “Dangers of walk-in medical procedures” and “Could a common fibroid procedure cause cancer?” (www.doctoroz.com). He also combines this fear appeal with specific recommendations (to lose weight, use this pill for example), which increases effectiveness of the fear appeal (pg 172). This seems to be because you cannot just scare someone, you have to give him or her a way to ease his or her fears in order for the message to be effective and Dr. Oz appears to be a master at this. With all this in mind lets review and see how Dr. Oz measures up on the criteria shown to increase his persuasive ability. Dr. Oz is credible, attractive, and familiar. He uses fear appeals to grab attention so people attend to his informational message. He then follows these fear appeals with specific instructions on how to reduce the fear. Dr. Oz scores extremely high on all of these criteria and applied social psychology principles would predict that he would be persuasive. This is inline with Sen. McCaskill’s comments. Applied social psychology therefore, provides a good theory (based on research and not opinion) as to why Dr. Oz is such a powerful influence on the substantial number of people who watch his show and the Senate has good reason to be watchful of him. Aronson, E., Wilson, T. D., & Akert, R. M. (2013). Social Psychology (8th ed.) Upper Saddle River, NJ: Prentice-Hall. Health is an important part of everyone’s lives. It is what keeps illness away and gives us a chance to live longer. The problem with society is that not everyone knows how to live a healthy life. Through applied social psychology, people can learn how to have a healthy life. Healthy lives are promoted by schools, society, and other influences. In order for people to be promoted by health, influences often use the idea of prevention. To do so, the social influences target ways to reduce unhealthy lives and behaviors (Schneider, Gruman, & Coutts, 2012). When the ways to reduce unhealthy lives is shown, people are able to understand what they can do to live a healthy life. What is important to know about health related to applied social psychology is the importance of social influences. Social influence is when those around us affect our behaviors and beliefs (Schneider, Gruman, & Coutts, 2012). With that being said, the beliefs of those around us will affect our health both negatively and positively. The way media is portrayed is also important on our beliefs. We should want to be healthy, but we should also not expect to look like a model or be extremely thin. When thinking about the media and health, TLC channel has a show “My 600 pound life.” This show portrays what can happen when people do not have healthy lifestyles. Informational appeals, or facts about health, are used to promote the need for healthy lifestyles. In this show, the overweight people on the show not only explain their health problems and journey after having gastric bypass surgery; they also speak about how those around them affect the way they gain or lose weight. Positive emotional support from families is often a benefit and increases weight loss. For most of the people on the show, there is weight loss when their family supports their choices and promotes positive eating habits. Our lifestyles and those around us will affect how healthy we are. It is essential to promote positive health and implement ways to become healthier, live longer, and have less illness. Applied social psychology gives people the understanding of how to become healthier and how to promote healthy lifestyles to others. Schneider, F. W., Gruman, J. A., Coutts, L. M. (Eds.) (2012). Applied Social Psychology: Understanding and Addressing Social and Practical Problems (2nd ed.). Applied social psychology is a branch of psychology that can help people in many aspects of their lives. When looking at one’s life, their health can be affected mentally and physically. While health can be looked at personally, family and friends can also influence health. The health of society is a factor in the schools which can be influenced by applied social psychology. Healthy body figures and minds are the focus of many people in society. To promote healthy living, prevention is often highlighted. This prevention is a way to decrease chances of developing a disorder or illness (Schneider, Gruman, & Coutts, 2012). Most children are influenced by those around them such as family, peers, and media. These social influences use persuasion to try to reduce and unhealthy lifestyle. My niece just started preschool this fall. Since it is her first year, my sister and I try to make this experience as special as we can for her so we decided to make Halloween treat bags for her classmates. While we just started gathering out items, we had to keep in mind that the children are no longer allowed to bring in candy or any other type of treats. To help promote healthy lifestyles to the children, the school does not allow sweets. This type of intervention would be considered a primary prevention. This is when the prevention focuses on healthy individuals (Schneider, Gruman, & Coutts, 2012). For children, this is important because they are able to learn what healthy eating is and why it is important. For my niece’s school, they had broccoli on the menu for Friday’s lunch. Most young children do see that as a healthy food, but giving it as an option without any sweets allows them to try new types of food. When considering other ways to promote healthy living, the model of windows of vulnerability is used by schools. This is when young people are influenced by social influences when it comes to healthy lifestyles and beliefs (Schneider, Gruman, & Coutts, 2012). Schools use this model to educate our youth and give them the opportunity to choose healthy living. While it would be easy to make treats and candy for my niece’s classmates, her school takes the time to show children better options. Through the knowledge of applied social psychology, schools are able to promote healthy lifestyles in society. While children learn from parents, they also learn from others around them. Schools use different models to show the children how to be healthy and explain the importance of health. The children are then able to spread knowledge to others around them. A recent CNN article titled, “’Toxic stress’ can harm your child” by Nadine Burk Harris, discusses how chronic stress in childhood due to adverse experiences can cause a slew of health concerns. According to Harris, a Pediatrician who works in one of San Francisco’s low income neighborhoods, chronic stress can affect brain and body development; increasing the chances of developing chronic pulmonary obstructive disease in addition to other chronic diseases such as obesity and diabetes. She states that research has discovered that these same children will possess increased inflammatory markers as adults. Stress has been defined as “a particular relationship between the person and the environment that is appraised by the person as taxing or exceeding his or her resources and endangering his or her well-being” by Lazarus and Folkman (as cited in Schneider, Gruman, & Coutts, 2012, p. 183). Their view is called a transactional model of stress (Schneider, et al., 2012) and supports Harris’ claim that “toxic stress” is chronic stress caused by negative experiences. Lazarus and Folkman would call these experiences “stressors” since their model states that some experiences induce stress and others do not (Schneider, et al., 2012). While Harris mainly refers to negative experiences common to low-socio economic areas, they are not confined to those areas alone. Lazarus and Folkman state t hat experiences are appraised by the individual and that “no two people will experience [a situation] in exactly the same way” (Schneider, et al., 2012, p. 183). Additionally, some researchers argue that stress is not only a result of negative experiences, stating that positive experiences can also cause stress (Schneider, et al., 2012). For example, a study involving couples planning their wedding illustrated high levels of stress when compared to other typical couples (Schneider, et al., 2012). These findings could imply that children may experience “toxic stress” even when involved in positive experiences –again, if the individual appraises the experience as stressful. If stress is perceived by the individual, the next step in the transactional model is coping –which “refers to thoughts, feelings, and behaviors that people engage in when trying to reduce stress” (Schneider, et al., 2012, p. 184). Similar to the way in which each individual appraises an experience as stressful or not, so too will be determine their coping mechanism (Schneider, et al., 2012). However, coping mechanisms can be generalized in two categories: problem-focused and emotion-focused (Schneider, et al., 2012). Problem-focused coping refers to when an individual is direct in dealing with the issue; whereas emotion-focused coping refers to when an individual adjusts their emotions to offset the feelings of stress (Schneider, et al., 2012). Harris suggests that by simply interacting with children in positive ways such as talking and playing, it will support healthy development. Her approach aligns with problem-focused coping since it is action based and deals directly with the problem. Ultimately, research agrees that stress can negatively impact health; which agrees with the last stage of the transaction model: health outcomes (Schneider, et al., 2012). Harris’ argument also aligns with these findings, indicating that children with “toxic stress” are more susceptible to many chronic diseases such as diabetes and heart disease. Research findings by Sarafino (2002) and Brannon & Feist (2000) concur, illustrating higher incidences of health issues that ranged from headaches and asthma to respiratory diseases and infectious diseases (Schneider, et al., 2012). It is safe to say that stress is something everyone should be wary of. When faced with a stressful experience, it is imperative to control the situation through a coping mechanism of choice. If stress levels are controlled, it can positively impact one’s health and longevity. Burke Harris, N., (2014, September 26). “Toxic Stress” can harm your child. Retrieved from http://www.cnn.com/2014/09/26/opinion/harris-toxic-stress/. Schneider, F. W., Gruman, J. A., and Coutts, L. M. (Eds.) (2012). Applied Social Psychology: Understanding and Addressing Social and Practical Problems. Thousand Oaks, CA: Sage Publications. Companies are always searching for ways to become more profitable and increase productivity, but at what cost? There are many issues that result in overworked and stressed out workers that can lead to health issues and other problems such as depression and alcohol abuse. A more recent concept to help battle this type of burnout is work engagement, which can be described as workers “who approach their work with energy, dedication, and focus” (Association for Psychological Science, 2011). So how can work engagement help? The goal of empowering your employees with work engagement is to give them the sense of purpose and fulfillment in their job. When an employee feels engaged in the work place they tend to produce more and be more innovated while taking initiative to help improve the work environment and the service and/or product they are working for. Arnold Bakker (2014) mentions that “research has revealed that engaged employees are highly energetic, self-efficacious individuals who exercise influence over events that affect their lives,” this can be beneficial not only for the company but also the employee (Bakker, 2014). If employees are willing to go the extra mile and feel satisfied in their work place no matter their position then one may guess their livelihood may be more satisifying as well. If you were happy and enthusiastic about your work that would carry over into your everyday life, and when you feel better about yourself you tend to make better decision in your life. These choices can lead to healthier lifestyles and more active as well which can lead to less time sick. With less time being sick means you are out of office less and go to the doctor less, a win win for reducing cost in healthcare and increasing productivity in companies. So many illnesses are stress related and a main trigger of stress is work. Since the majority of people work at least at some time in the life it would seem like a great place to start would be in the workplace. The best way to improve the overall health and well-being of a population is promote healthier lifestyles and prevention of stress and illness (Schneider, Gruman & Coutts, 2012). A model to back up the support for work engagement is the theory of planned behavior or more importantly perceived behavioral control, where a person believes they have a certain amount of control or influence over their behavior and this is an important element in employee engagement. When employees feel like they have control over their work and are a part of something bigger they tend to give more. And when an employer gives the same energy back the mutual effect is a bonus for both sides. After reviewing some of the top companies to work for Google is up on top a lot, but why? Maybe it’s they give their employees the freedom to choose when they work, incredible perks and stimulating work environments, and also a say what happens in the company, while these kind of things may not be able to be offered from other companies the point is that they may hold “the future of workplace leadership” (Crowley, 2013). This type of intervention in the work place could affect the population is such a positive manner. Not only is it studied in health psychology but also in positive psychology, work engagement can be a powerful tool for the future of people’s life quality. “Employees’ own personal resources- such as self as self-esteem and optimism- also contribute to work engagement” so imagine if this influence could start in the work place where almost everyone goes on a daily basis (Association for Psychological Science, 2011). That really is an inspiring thought to think that everyone could enjoy going to work and stop dreading Monday’s, I only hope that more companies will start adapting this type of thinking for society as whole, for we might all benefit in our daily lives as well as a population. Schneider, F.W., Gruman, J.A., & Coutts, L.M. (2012). Applied Social Psychology: Understanding and Addressing Social and Practical Problems (Second ed.). Thousand Oaks, CA: Sage. Post-traumatic stress disorder, (PSTD), affects millions of Americans. The roots of this disease stem from traumatic experiences. After being involved in a life threatening experience, some people develop systems of PTSD a month or so following the incident. I have a neighbor who suffers horribly from this disease and understand the implications of not receiving the proper intervention for it. More social psychology intervention needs to be brought into this field to assess and help the patient. My neighbor is a 60-year old Vietnam War veteran, and it behooves me to see how he still suffers from PTSD to this day. His past veteran history has been compounded with a recent divorce that has become devastating and overwhelming. He frequents the veteran’s psychiatric unit where he was clinically evaluated and prescribed medications. He has sessions with a psychiatrist and social worker more than two times a week. From my observations, these evaluations that have been ongoing for years are mere trial and error sessions. His medications include antidepressants and antipsychotic drugs in an effort to keep him sedated and calm. Suicide has been attempted multiple times, and he always fear that his neighbors are plotting to kill him. The National Institute of Mental Health (NIMH) has done research on PTSD and related studies on fear and anxiety to aid people in coping with trauma. Studies have been conducted on the brain, its functions, and chemicals released as a result of fear and trauma. Early intervention focusing on disturbances in the memory, such as, bias, memory formation, and saliency can help in slowing down the development and maintenance of PTSD. Cognitive behavioral therapy (CBT) has been used to help individuals think and reach to frightening experiences that can trigger PTSD and help them cope. Also, by using these measures of therapy, the NIMH researchers have been able to study the brain response to certain medications while responding to CBT. Sometimes an individual’s core cognitive schema is inconsistent with the patient’s traumatic event. He has difficulty integrating his past experiences into his existing schema. This disintegration eventually manifests and can lead to behaviors and symptoms of PTSD. There are structured forms of psychotherapy including, exposure therapy, cognitive restructuring, and stress inoculation training. Some forms of research attempt to enhance personality, cognitive and social protective factors and minimize risk factors in an effort to prevent full-blown PTSD after trauma. The identification of certain factors and their response to an individual regarding PTSD is still being researched (Brewin, 2005). Another form of clinical research by the NIMH is to create approaches via the Internet and telephone to promote self-help therapy and telephone-assisted therapy. There are also research programs where a person with PTSD can meet their therapist face to face on websites. A therapy session can be conducted this way. This can help lower the stress and aid the patient in dealing with his fears and problems. Intervention programs are being studied in order to respond to risk factors of PTSD before they become full-blown. The aim is to develop more effective and personalized treatments for the patient. Other psychological interventions that have been studied and utilized include coping skills therapy, eye movement desensitization, reprocessing, and debriefing interventions. These interventions have not been fully successful and effective. Interventions need to be expanded and more programs involving exposure and interactions should be promoted. Anyone can develop PTSD. It is not exclusively a disease for war veterans. It can be brought on by an unexpected death, a traumatic loss or even extreme fear. Most children and teens suffer from this disease if something traumatic has occurred in their lives. Children who are exposed to domestic violence can also suffer. Clinical studies for this type of treatment presently involve trauma-focused cognitive behavioral therapy (TF-CBT) as opposed to child-centered therapy (CCT). My focus regarding PTSD is mainly geared toward the veterans of war. I feel that their disease is not as controlled as it should be. We as a society should not let our thinking fall into a group bias situation, but instead attempt to recognize these individuals and help to promote the funding and therapy that they are deserving of. A recent occurrence can prove my point. Omar Gonzalez, a war veteran, broke security and attempted to enter the White House. Authorities later found 800 rounds of ammunition, hatchets, and machetes in his car. It was determined that he too suffers from post-traumatic stress disorder, and his family has stated that Gonzalez not only has lost his home and material belongings in his life, but has lost his mind due to serving his country (Fernandez, et al. 2014). I feel that with all the monies that are spent by our country for research in the medical field, this disease should be given more priority for prevention and keeping it controlled. The clinical studies and health issues that are involved in PTSD are vast and still in progress. Research is constantly being improved to help these victims and survivors, but not enough. I feel that this disease should be intercepted before it reaches its full impact on an individual. Hopefully, the proper interventions and research will cure this problem and assist the sufferers of these dreaded disease. An attack on the roots of the disease for each individual should be assessed and conquered so that our veterans can live their daily lives to the fullest. Brewin, CR. (2005). Risk factor effect sizes in PTSD: what this means for intervention. J. Trauma dissociation. 6,123-130. Montgomery, D., Fernandez, M., (2014). Omar J. Gonzalez, Accused of White House Intrusion, Is Recalled as Good but Troubled Neighbor. The New York Times. Retrieved from www.nytimes.com/2014/09/24/us/omar-gonzalez-veteran-white-house-fence.html. What is happiness? Happiness, although experienced by many on several different occasions is a concept that cannot be equally defined across cultures. Modern psychological studies measure happiness on three levels. 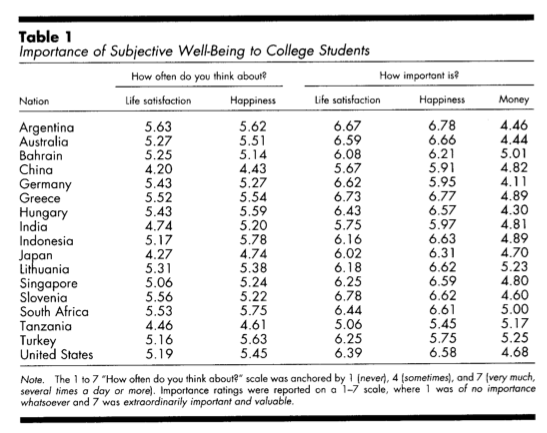 This is most commonly called the measure of “subjective well-being” and include an individual describing whether they feel good, bad, or satisfied with life (Chang, 2014). Countries can be ranked on this three measures of happiness. As described in this particular article, in our Western culture we see happiness as one of the highest and most treasured human goods. This article definitely gave me quite a few things to think about in terms of the culture that we live in and the values that I was taught to hold as a child and even now as an adult. Growing up we always sought out the things that made us the happiest, most of us were told to do whatever we wanted with our lives as long as it made us happy. Growing up in this culture, it is hard to comprehend that in other cultures there is a certain level of fear that is held towards the feeling of happiness. A man by the name of Mohsen Joshanloo, a published author who holds a PhD in Philosophy and Social Psychology, writes that there are many forms of fear that can be held towards happiness. This can be shown by hate displays, anxiety, and looking down upon those who pursue happiness (Chang, 2014). When it comes to the Eastern culture it has been found that they tend to hold moral actions and social duties higher than the euphoric state of happiness (Chang, 2014). A possible reason for this shift in attitudes about happiness can be thought that happiness is seen as fragile. I can recall several times in my life where my potential happy moment was overcome by sadness or disappointment over something so simple as a change in plans or even weather. This behavior leads me to wonder if the pursuit of happiness is healthy for our culture as a whole? Several clinical studies have been done to study the fear of happiness and they have found that the pursuit of happiness can actually help people to overcome depression, although not all people who hold a fear of happiness are at a risk for any mental illnesses (Chang, 2014). Although a study done by mental health researcher Paul Gilbert concluded that the fear of happiness had a strong positive correlation to depression and other depression-related beliefs (Chang, 2014). Although cultures do hold different views of happiness, the positive psychological movement has become a pop-culture phenomenon in our Western society which has paved the way for an overproduction of self-help books. Learning such things made me analyze my own value placed on happiness and I have found that I fall in a small percentage of those who believe that unhappiness follows happiness, so I do hold a certain level of fear for the sensation. I feel that this has come from several situations in my childhood where I held high expectations of a good situation and became disappointed afterwards since it never met my expectations or that something incredibly bad always seemed to happen on the days that I was feeling good and happy. As with everyone else in this world I have gone through several bad moments in my life but the cure for this was always the pursuit of happiness, even if it was in something small like a walk outside or drawing a picture. Happiness, a concept that has no one true definition, is something that helps us understand how complex and diverse the cultures of the world truly are. Although not entirely universal, the sensation of happiness has been found to have an impact on our mental well being as well as our physical well being. It is hard to understand how an emotion can have such an impact on our mental condition or how it can make a major difference in our everyday lives. The video eerily depicts the thoughts, behaviors, and actions of a combat Marine veteran who clearly is struggling with Posttraumatic Stress Disorder (PTSD) from his time spent in either Iraq or Afghanistan. The Marine is a husband and a father who has been kicked out of his home by his wife because of his PTSD. In the video the husband and wife can be seen talking to one another about him being around his son more but the wife states only if he begins to take his medications again. While in the park, his son spots a stray marked up pit-bull that appears to have been in a fight. The son would like to take him home and his mother instinctively says no. The father reaches out to the pit-bull to show his wife that the dog is harmless despite his marks and his breed. On his son’s birthday the father goes to the house where he and his wife have an altercation once again over their son and visitation. What happens next is heart wrenching. The father has a very nasty flashback to war in his tiny apartment and he picks up a loaded gun and begins aiming it around the room. His wife and son show up at the apartment and his son opens his door to find him pointing the gun at the wall. The wife closes the door as she walks in and pushes their son out. Despite desperate please, the wife is unable to break her husband from his flashback. He then takes the gun and places it under his chin – dropping to his knees. She continues to plead but the please continue to fall on deaf ears. At that moment the pit-bull runs up, starts licking the Marine’s face, and it breaks him out of his flashback where he sees his wife and then asks for help. The final scenes show the family driving to the hospital where he will be able to receive the proper care and treatment. PTSD develops after the individual has experienced a traumatic event in their life that has either caused physical harm to the person, or there was an extreme threat to cause physical harm (National Institute of Mental Health (NHIM), 2014). A person can also develop PTSD by witnessing a traumatic event take place where physical harm was done not just to the individual’s loved ones, but even strangers (NHIM, 2014). Traumatic events that can cause PTSD include, but are not limited to, the following: car accidents, sexual assault, natural disasters, bombings, torture, child abuse, and robbery (NHIM, 2014). One of the biggest forerunners to PTSD and most likely one of the widest known causes of PTSD today, was also the first reason to break into the public attention sphere is veteran PTSD dating back to the Vietnam War (NHIM, 2014). The commentary this week stated that one of the key factors for applied social psychologists is stress when they are engaged in working on problems related to health. Stress is a natural process that aids us as humans to cope with events in our lives that challenge us, but what happens when the natural process of our “flight or fight” response is damaged and broken? With persons suffering from PTSD, this process is often times severely damaged and broken which creates the feeling of being constantly stressed or frightened even when the individual is not in any real danger, or there is no threat of physical harm (NHIM, 2014). An example of this would be when the Marine veteran in the video is safe in his apartment but his flashback creates the illusion that he is in danger and his life is being threatened. Flashbacks can happen at any time and can be triggered by a magnitude of things: fireworks, vehicle exhaust backfire, a loud banging noise, loud noises in general, etc. Anxiety can occur in loud areas, around many people, having to think about going to the store, etc. Stressors are perceived as harmful, and their stress is continuous. Drug abuse. Alcohol abuse. Isolation. Aggressive behavior. The coping mechanisms applied here are quite common to veterans who are suffering from PTSD, but obviously are not helpful. In a report released by the Department of Veterans Affairs, 22 veterans commit suicide a day which equates to one veteran every sixty-five minutes (VA, 2013). To make that an even clearer picture – in two days and nine hours we lose 53 veterans to suicide which is an entire National Football League team, and in two months, two weeks, three days, and two hours we lose 1,696 veterans to suicide which is the total amount of players in the entire National Football League. 22 a day is too many. How can we change the coping aspect for a veteran so that we can save his/her life? The stigmatization that is associated with seeking help for depression needs to be addressed and changed first and foremost. In the military you are trained to be tough. You are trained that sadness is a sign of weakness. Through the years, however, these thoughts have been attempted to be changed through suicide prevention classes, but are they effectively working? With suicides on the rise in the active force and with veterans, I am not so sure. Other programs and resources need to become more readily available to our national heroes suffering from PTSD in an attempt to change their coping behaviors as well. One program that is triumphing in helping our veterans cope with PTSD is the Paws4Vets program based out of Wilmington, NC. The program screens and works with veterans suffering from PTSD to “bump” (place) them with trained psychiatric service dogs for free once the service member has completed successfully the necessary training with their service dog. Martin Seligman developed the learned helplessness model of depression after an experiment with dogs who became depressed also became psychologically helpless (Schneider, Gruman, & Coutts, 2012). Helplessness is a factor in veterans suffering from PTSD. The Paws4Vets program aids in reducing the helplessness factor through the use of the psychiatric service dogs by creating a shift in the veterans’ state of mind so that they can change their circumstances. The dogs are attentive to their needs and aid them in reducing stress, and anxiety which allows the veterans to work towards becoming functional parts of society once again. Unfortunately, the dogs come with a heavy price tag to train – $30,000 per dog to be exact. The program runs on donations but is unable to solely provide service dogs to all of those in need. Other programs have developed for training service dogs to place with veterans as well. The Department of Veterans Affairs has just kicked off a random control trial to effectively test the use of psychiatric service dogs and hopefully in the near future the VA will be able to place psychiatric service dogs with veterans suffering from PTSD. National Institute of Mental Health (2014). What is Post-Traumatic Stress Disorder? Retrieved September 28, 2014 from http://www.nimh.nih.gov/health/topics/post-traumatic-stress-disorder-ptsd/index.shtml. When we were told to create a blog based on a subject which may occur in our lives which we could apply some of the theories we have been learning about I immediately thought of an occurrence which happens almost everyday at my work. I work as a certified drug and alcohol counselor. When clients come to me they normally have a few commonalities. First they have a diagnosis of a substance abuse disorder that has had a very serious negative impact on their lives. Second following the diagnosis of substance abuse they normally have a diagnosis of depression. I see these two diagnosis’s working against one another. They use substances to help cope with their depression but the substance use causing negative consequences makes for more serious depression. In drug and alcohol counseling we call this being in a state of terminal hopelessness where a person can not imagine life without the use of drugs or without being severely depressed and feels trapped. I would like to identify how the hopelessness theory of depression and the self-efficacy theory could help bring about hopefulness for these clients. The hopelessness theory of depression has a causal model associated with it which ends with hopelessness. Hopelessness is defined as “the expectation that highly desirable outcomes will not occur and that one is powerless to change the situation” (Schneider). In the causal model my clients generally would experience something like this. First they would start using drugs and alcohol either to cope with an earlier negative life event or as a social coping mechanism. As time goes on negative outcomes of the drug use such as being arrested begin to build a pattern starting to establish a negative view of oneself. As this pattern continues the client begins to believe that these events are of high importance and are creating who they are. As this goes on there drug use begins to effect others and they begin to lose social support. The client begins to blame others for the negative circumstances in their lives because they are trying to fight off the negative views of themselves. This ends up as a negative view of the world and people who used to be their primary support. As this pattern continues the client begins to believe that the future will hold more of the same negative outcomes. 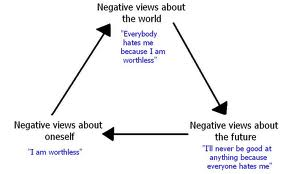 These negative views of oneself, the world, and the future brings about the hopelessness theory of depression. Also associated with hopelessness depression is a low self worth, low self esteem, lack of motivation, and a overdependence on people or in this case drugs and alcohol. The client believes they are stuck in a cycle which is impossible to get out of. So the question is how can a hopefulness therapy and self-efficacy help improve the functioning of these individuals. Hopefulness therapy is designed to help people set goals and help people find ways around barriers to achieve them (Cheavens). Setting small goals also help raise a persons motivation which is much needed in a person with hopeless depression. An example for my clients would be beginning to plan their day setting a few small goals. Returning in a week show the clients how much those small goals helped them achieve in just a week. Another example would be if a client did not have transportation to find employment help them look into public transportation schedules and resources for free bus tokens to remove that barrier so they do not continue to feel stuck. It also helps people identify their strengths and use them for a new direction in their lives. There has been studies done on this type of therapy done at Ohio State University which have shown improvements in functioning for people with this therapy. In conjunction with hope therapy with my clients, the use of the self-efficacy theory which was developed by Bandura seems to be a good application. Self-efficacy helps people believe in their capabilities to overcome difficult tasks rather than avoid them (Bandura Pg. 231). Which overcoming a drug and alcohol addiction and depression can be extremely difficult. Research has shown multiple ways to improve self-efficacy and I will focus on one. Seeing others that are similar to the client that have succeeded in sustained success in overcoming addiction and depression helps improve self-efficacy. With my clients the group setting motivates them to feel they are not alone in trying to overcome there issues but I have found that suggesting a client to attend 12 Step meetings lets them experience people who have sustained success which helps them find hope and therefor raise self-efficacy. It also helps that 12 Step programs have been showed to be successful for over 80 years now. I find that knowing that it has a long history of being successful means that clients will get to experience people who have had long term success. The application of these two theories as modes of therapy will bring about lessoned symptoms of depression, lower drug and alcohol use, and therefore overall functioning. Because both of these approaches have research which shows success that these are good theories to apply to a current life situation that I have working with my clients. It helps also that these practices have already been being used. It helps understand where research has been done and has seen success to use these approaches more often and gain understanding of how they can be applied in a more successful manner. Schneider, F. (2012). Applying Social Psychology to Clinical and Counseling Psychology. In Applied social psychology: Understanding and addressing social and practical problems (2nd ed.). Thousand Oaks, Calif.: SAGE Publications. Carousels, face painting and food: this was my idea of a good time as a child spending the day at an amusement park. Unfortunately, my parents and older brother could only stand it for so long. They took to the more thrilling rides, while I opted to sit by myself and wait for them to get done. Roller coasters were always something I had a phobia of as a child, or according to Bandura, an irrational fear (Bandura, 1986). On this day at the amusement park, I got over my phobia of roller coasters and until now, I had never realized that it was through Bandura’s way of observational learning. According to Bandura, observational learning is “watching someone else perform a behavior and then the observer performs a similar behavior in a similar situation” (Bandura, 1986). 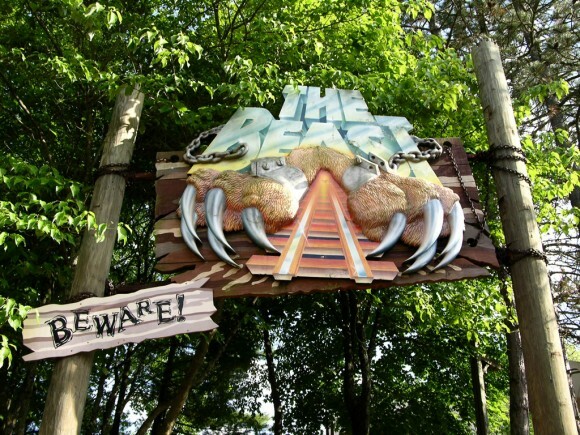 In my example, I watched my family have a great time while riding a roller coaster called, “The Beast” and realized that it is something I can also do without being afraid. However, this process was not as simple as it sounds. There are several components to observational learning, which include attention, retention, motor production, and motivation or opportunity. According to Bandura, the first step, or attention is “the ability of the learner to actually observe the behavior in action” (Bandura, 1986). For the first step of overcoming my phobia, I waited outside of “The Beast” and observed my family ridind the roller coaster. Although it was a little hard to see my family on the roller coaster because of the turns and loops, there were a few points where their train was in my view and I could see them laughing and having a great time. Once they got off the coaster, they immediately asked me if I was ready to try going on one. This brought me to the second step in the process of observational learning. According the Bandura, the second step, or retention, is “the ability to actually remember what one is observing” (Bandura, 1986). As I stood in line to board the roller coaster with my family, I saw a few upset children preparing to board, as well. In order to regain my own confidence, I needed to recall how much fun my family appeared to be having while riding the roller coaster. I stood in line as we waited and thought about how I should be excited because I was about to have a lot of fun, not afraid. I told myself that riding the roller coaster would be easy and fun because all I had to do was strap myself in and enjoy the ride. This brought me to the third part of observational learning. According to Bandura, the third step, or motor reproduction is “the actual physical ability to engage in the behavior” (Bandura, 1986). Fortunately, riding a roller coaster does not take much aside from a height requirement and the ability to sit. I easily met both of those requirements, so this part of the learning process was not a problem for me. The final step quickly arrived as the train of the roller coaster screeched to a hault in front of my space in line. This was the moment I had been waiting for. In order to accomplish the last step of observational learning, I had to have the motivation and opportunity to overcome my phobia. According to Bandura, this means that I needed to have the “desire and chance to engage in the set of behaviors and hone in on the skill set” (Bandura, 1986). The empty train car in front of me represented the opportunity to ride the roller coaster. As I declared, “Let’s do it!” to my family, this represented my motivation to finally overcome my phobia of riding roller coasters. Nowadays, our family trips to amusement parks are much more exciting because we can all ride the rides together and bond over having fun doing the same things. It is strange to think back on events such as this in my past and realize that I was taking the steps of observational learning to overcome a phobia. Overcoming my phobia of roller coasters has opened the door to more exciting opportunities in life such as my senior year trip to Cedar Point and some of the most fun dates I have had with my husband.